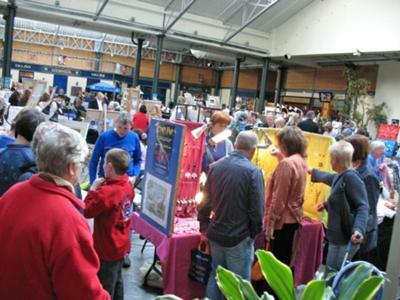 We really loved the craft market inside Merchant Square last year. The quality was amazing - all sorts of stuff, all made by hand. Julie's old enough now to spend weekends with us, at school holiday times. In the summer we had a really good day out, at the River Festival. Were you there? They had these rides for kids, and this sort of harness thing attached to big springs. I swear this is true - they had to take their shoes off, they they went bouncing off into the sky! My husband Kenneth could hardly look! But Julie had a blast, and thats what counts! We took her to M & Ds at Strsthclyde Country Park. That was cool as well. I'm looking forward to the official Guy Fawkes fireworks, and the German Christmas market too. The more I think about it, we're quite spoiled for great things to do, aren't we? You never know - we might bump into each other. Take Julie to other things? I can report that this years official guide lists the Crafts fair... See you there! We're taking Julie (our niece) this year. I think she'll be hunting other things like her fairy doors. Bless her. I'll have to keep hold of her hand, she'll be so excited. I think this was in the old fruitmarket. my fav too... take your christmas list! Think it is the last weekend each month, but save yourself for the festival version - the buzz is amazing that weekend!